Tiger Mom: "16: Too young to have girlfriend... 26: Why aren't you married?!" When I discovered Amy Chua’s infamous “Tiger Mother” article in the Wall Street Journal almost a month ago, the thing that shocked me most — after reading the headline “Why Chinese Mothers Are Superior” — was the photo underneath: Amy Chua standing before two unmistakably half-Asian half-Caucasian daughters. It was as if she pointed to my own future, my possible interracial children, and demanded I follow her every “Tiger Mother” pawprint. Like Amy Chua, I have a connection to Chinese culture, since I have a Chinese husband. And if I choose to have kids, mine would be half-Asian, half-Caucasian, just like her interracial children. But there is one big difference — I would never be a “Tiger Mother” to my future children.. Nothing less than number one in class, and straight A’s? Tiger Mom: "You Can Have Sleepovers... When You're Married!" It’s no secret that such an extreme, authoritarian parenting style can hurt. But parents like Amy Chua somehow justify it. They point to their “math whizzes and music prodigies,” while ignoring the above-average suicide rate among Asian-American students, or the Asian-American guy in his mid-thirties who still struggles with the fact that his parents called him “stupid” most of his life. But what baffles me even more is Amy Chua’s blind insistence that, in parenting, East is best Tiger Mother style. This, despite her upbringing in the US, interracial children, and Jewish husband. The thing is, one of the greatest things about being in an intercultural, interracial relationship is that you can borrow the best from both cultures. Which is why I believe it’s possible to have the successful kids, with none of the social and psychological scars left behind by a Tiger Mother. 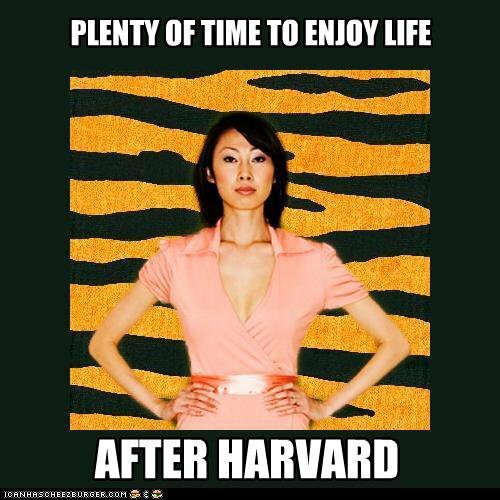 Tiger Mom: "Plenty of time to enjoy life... AFTER HARVARD!" I think the East Asian drive for success is great, and I would expect my children to attend the best college they can. But success shouldn’t be defined by getting nothing less than straight As or being the next Lang Lang or Einstein. In school, it should be just like what my father used to say: “As long as you try your best, you’ll never disappoint us.” In life, it shouldn’t be about fulfilling a parental fantasy of becoming a doctor or lawyer — but instead, encouraging a child to discover who they are and what they truly love to do. I want my future interracial children to be happy because they achieved their dreams, not mine. Which leads me to my second, more Western idea — supporting children in a loving, responsive and understanding way. It’s not love, as Amy Chua suggests, to call interracial children “garbage” or reject their handmade greeting cards. Now, being loving and responsive to children doesn’t mean you coddle them or never discipline them (believe me, I had my share of groundings as a child, and I’ll be ready with those timeouts and groundings for my own children). But it does mean that you think their psychological well-being matters as much, if not more, than their grade point average. I don’t know about you, but I don’t want to be the reason why my child has to see a shrink for most of their adult life. I would borrow from the East and the West to help my future children love and value their family. I think every child should respect their elders, just as most Asian countries have for centuries. But I would never tell my future children they owe me everything. This should be family, not some dictatorship or prison that would have the child fleeing their upbringing for the rest of their lives. But the West has it right when it comes to perhaps the most gaping hole in Amy Chua’s “Tiger Mother” formula — socializing children. I would want my kids to have play dates and sleepovers, go on dates and go to school dances, and go out with their friends. These are precious opportunities to learn the kind of social skills that I’ll bet a lot of “Tiger Cubs” never had, but wished they did. More experts believe it’s your social intelligence that really makes you successful in life, from the workplace to the dating scene. I know in speaking with our resident Asian Dating Coach that he has to deprogram a lot of the negative beliefs and psychological damage that Asian men carry with them. “Tiger Mothers” like Amy Chua aren’t superior in my world. Maybe that’s because I know better — that blending the East and West reflects my future family better, and will make my future children successful in many ways Chua never imagined. Or maybe it’s just because I’m a lion, and tigers never scared me. Writer, Chinese translator and founder of Speaking of China, Jocelyn Eikenburg thinks tigers belong in the wild, not the home.